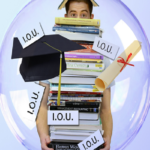 Are Your Student Loans Stopping You from Starting Your Business? Student loans are the 2nd highest consumer debt behind mortgages and higher than credit cards and car loans. Are your student loans stopping your dream of becoming an entrepreneur and starting a business?